The dates written on Bain negatives are often dates when the photo was used rather than when they were taken. en.wikipedia.org/wiki/Tex_Rickard "George Lewis "Tex" Rickard (January 2, 1870 – January 6, 1929) was an American boxing promoter, founder of the New York Rangers of the National Hockey League (NHL), and builder of the third incarnation of Madison Square Garden in New York City. 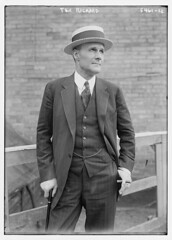 During the 1920s, Tex Rickard was the leading promoter of the day, and he has been compared to P. T. Barnum and Don King. Sports journalist Frank Deford has written that Rickard "first recognized the potential of the star system." Rickard also operated several saloons, hotels, and casinos, all named Northern and located in Alaska, Nevada, and Canada." Some descriptions are less positive, for example, www.boxing.com/scoundrel_time_promoter_tex_rickard.html Either way, there will have plenty of reason for him to be in the news around 1927. In March, 1927 he was running a heavyweight elimination competition at Madison Square Garden. See the [Washington] Evening Star. March 28, 1927, Page 24, column 7, mid-way down. chroniclingamerica.loc.gov/lccn/sn83045462/1927-03-28/ed-... On September 22, there was a big fight that he promoted, between Gene Tunney and Jack Dempsey in Chicago. See [Washington] Evening star. September 22, 1927, Page 2 chroniclingamerica.loc.gov/lccn/sn83045462/1927-09-22/ed-... 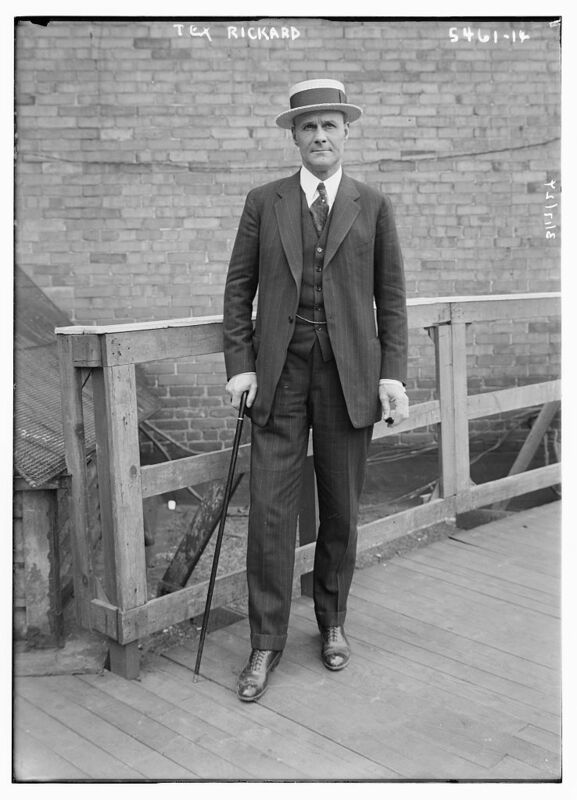 But it's also possible that these photos were taken in 1921 (the period for most of the photos in the current chunk from the Bain stream) because he was getting lots of press then too. The date on this negative is 3/17/24 (not 27) IMO.